Directions: How can we figure out how many dots there are below? What is another strategy for figuring out the number of dots? Strategies will vary for counting the 11 dots. Some will see a column of 5 down the middle and 2 sets of 3 dots on either side. 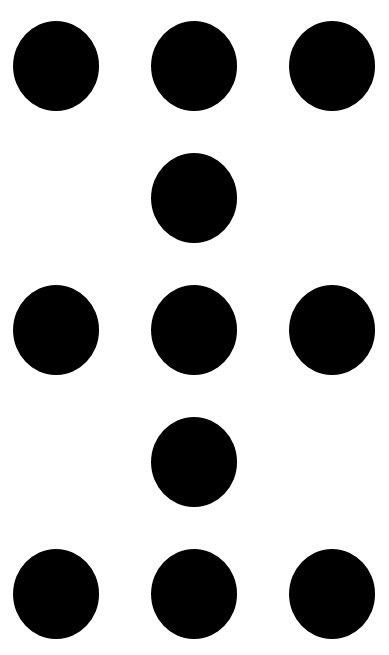 Some will see 3 rows of 3 dots and 2 extra dots between them. Source: Dan Meyer. Additional examples can be found here using a resource provided by Melissa Canham. The next step in dot card counting is moving kids to think about equivalence. Using the above sample, I’ve turned to first graders and asked them, “Is is legal to say, 5+3+3 = 2+3+3+3? Most will say, “No!” But a few will add up both sides and find that each side equals 11. And then, there’s always one or two who combine the 2 with a 3 on the right side of the equation and prove equivalency by showing 5+3+3 = 5+3+3. An ‘interesting’ question for students is how they’d count the same card if it were rotated 90 degrees. I tried it and the strategies changed for most students. They see the ‘pattern’ differently depending on the orientation. Of course, this can be used to introduce, informally, the idea of commutativity.